The output conveyors are positioned on the exit of the vertical packaging machine, as their main function is the transportation of the ready package to a metal detector, check weigher or directly to a rotary table for stacking. Besides that, the belts preserve the still warm seals of the packages from damage when falling and maintain the good appearance of the final package. 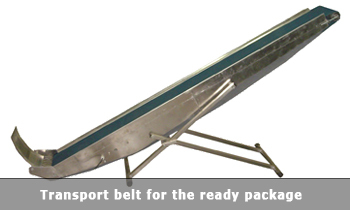 Adjustable slope of the transport belt. Rugged surface, which prevents the sliding of packages. Manufactured from stainless steel and meeting the requirements for work with food products.